You will need Python 3.6+ and ngrok installed on your machine. Chatbots are gaining grounds nowadays, more especially intelligent chatbots that can interact effectively with humans. In this tutorial, I will walk you through building a Chatbot using Flask, Pusher Channels, and Dialogflow. In the process, we’ll build a chatbot that will help us get details of a movie which we’d like to watch during the weekend. To make it more fun, we’ll build the bot in such a way that anybody viewing the bot page will see in realtime conversations going on. This will enable them to see a new and interesting movie to check out. The source code for the application is on GitHub. Before we start, check that you have the necessary tools installed. If the command prints something similar to Python 3.6. * or higher, then we are good to go. Now, we are ready to start writing code, but first, let’s create a simple structure for our project. With this, our project root folder is movie_bot. index.py: the main entry point of our project. requirements.txt: all libraries our project will be using. static: contains Static files like css and js. templates: our HTML files will live here. .flaskenv: this is where we’ll store Flask environment variables. .env: we’ll use this to store our private keys. requests: we’ll use this library to make a request to external URLs. dialogflow: to interact with Dialogflow’s API. python-dotenv: will be used by Flask to load environment configurations files. pusher: to add realtime to our chatbot. virtualenv is a tool to create isolated Python environments. It creates a folder which contains all the necessary executables to use the packages that a Python project would need. The command to use depends on which is associated with your python3 installation. Now, you should see (env) beside the folder name on your command line. This will instruct Flask to use index.py as the main entry file and start up the project in development mode. Here, we created a route - / -, which will render the index.html file in the templates folder. Now, visit http://127.0.0.1:5000. You'll get a blank page because there is no content in /templates/index.html yet. The OMDb API is a RESTful web service to obtain movie information. When a user asks our bot for details about a movie, we’ll make a request to OMDb to get the detail about the movie. 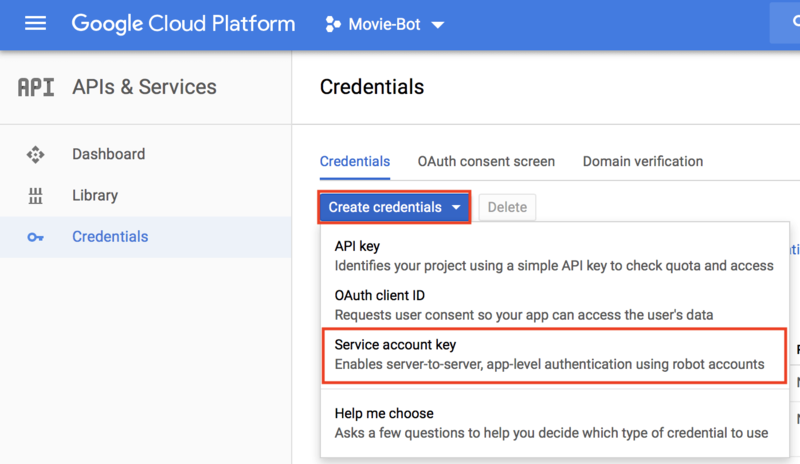 OMDb requires that we have an API key before you can use their service. To get a free API access key, head to OMDb. Sign up for a free account. An email will be sent to you that contains your API key. You also need to activate your account from the email sent to you. Replace API_KEY with your correct API key. The key looks like this: 6e**bb*f.
If we want to get the detail of a movie, we’ll make a request to http://www.omdbapi.com/?t=[MOVIE_TITLE]&apikey=[API_KEY]. The response will be a JSON object. Dialogflow is a Google-owned developer of human–computer interaction technologies based on natural language conversations. It will make our chatbot intelligent by using machine learning to understand what our users are saying. All we need to do is train it. If you already have an account, go ahead and click on the button to log in. When a user submits a message, we'll send the message to Diaglogflow. 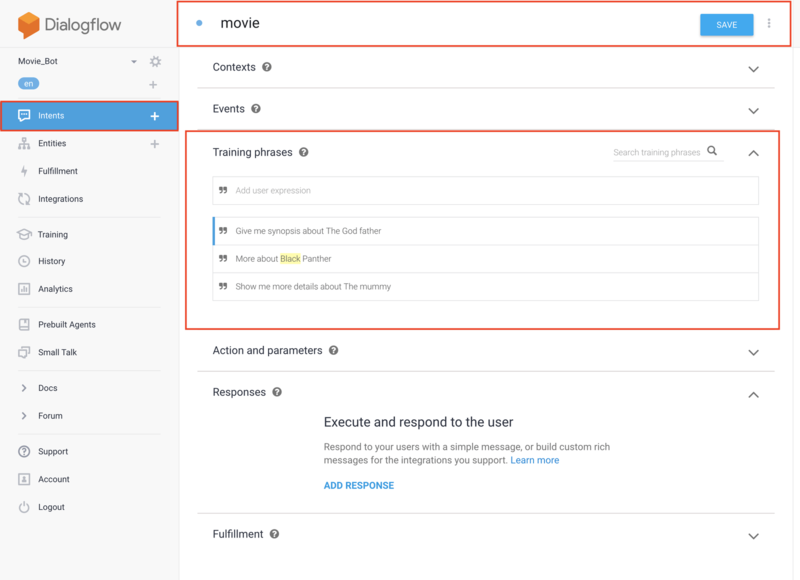 Then Dialogflow will detect the intent of the message and send back a reply (fulfillment text) to us. This will be the basic flow of our bot. Now, for our bot to know the intent of our user, be it greeting, asking about the bot or asking for details of a movie, we need to train our bot to understand that. The agent is our bot itself. Then, click on Create Agent to create a new agent. For sure, we know, when some users want to interact with our bot. They might want to exchange greetings. By default, Diagflow has this intent set already. All we need to do is enable it. When enabled, The bot will know when the user is greeting and reply with the appropriate response. Now, enable Small Talk using the toggle button as indicated on the image above. Feel free to customize the responses as you like. Once you are done, click on the SAVE button. When users ask about a movie, at the moment our bot won't know what to respond with because it does not know about movies. So, let's train it to understand when the user is asking about a movie. This will be a movie intent. Next, click on ADD TRAINING PHRASES under the Training Phrases section as indicated in the image above. Now, type in texts that a user is likely going to use to ask about a movie as seen in the image above. When you are done typing it in, click on the SAVE button. The entity is used for extracting parameter values from the user input. Let's train our bot to know which among the texts is the actual movie name. All we need is the name of the movie so we can search for the movie. Click on Entities on the sidebar. Next, click on the CREATE ENTITY button. Type in movie as the ENTITY NAME as seen in the image below. Then add one or more movie name of your choice as seen in the image below. Next, click on Intents on the sidebar. Under the intents lists, click on movie. Then for each of the intent you have typed earlier, highlight the movie name. You’ll get an entity option, then select @movie. Finally, on the same page, scroll down to Fulfillment and enable it to use webhook then SAVE. To make use of Dialogflow Python library, it requires that we have an API key. So we need to get it. Go to Google Cloud Platform. Replace project_id with the project ID you just copied. Select Dialogflow integrations under Service account. Then select JSON under key type. Your API key will be downloaded automatically. Now, copy the downloaded JSON file ( Movie-Bot-*.json) to the root folder of the project - movie_bot. Note: This is your API key, you should not commit it to a public repository. Make sure to use the correct file name instead of Movie-Bot-*.json. Now when a user asks our bot about a movie, it will detect the intent of the user but can't reply with the movie detail. That is where webhooks come in. When our bot detects the movie keyword, it will make a request to our webhook using the movie keyword. Now using the movie keyword, we'll query OMDb for details about the movie. Then send the result back to Dialogflow. We created a route named get_movie_detail, which is a POST method. Then, we got the json request that will be sent by Diagflow to the route using request.get_json(). Next, we extracted the movie keyword using data['queryResult']['parameters']['movie'][ 'movie'] from the request data. Finally, we returned a JSON response of the movie detail. 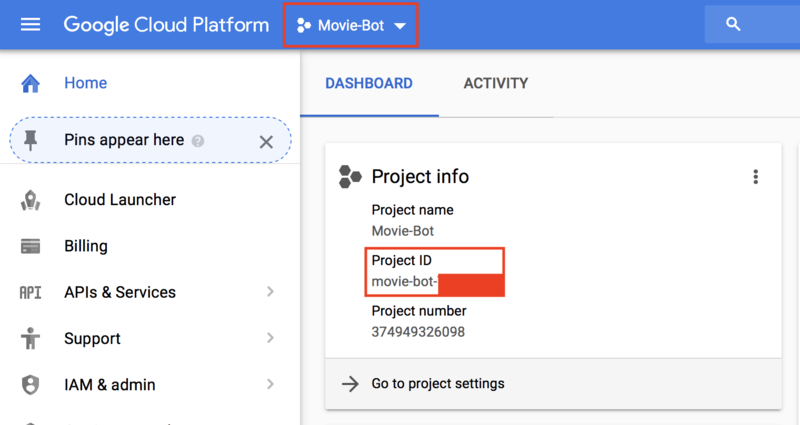 Now that we have created our webhook for getting details about a movie, let's add the webhook to Dialogflow. Oh wait, this is localhost, Dialogflow can’t access it! Hold on, Ngrok can help us out here. Copy any of the forwarding URLs, the URL similar to this https://0a36e90a.ngrok.io. 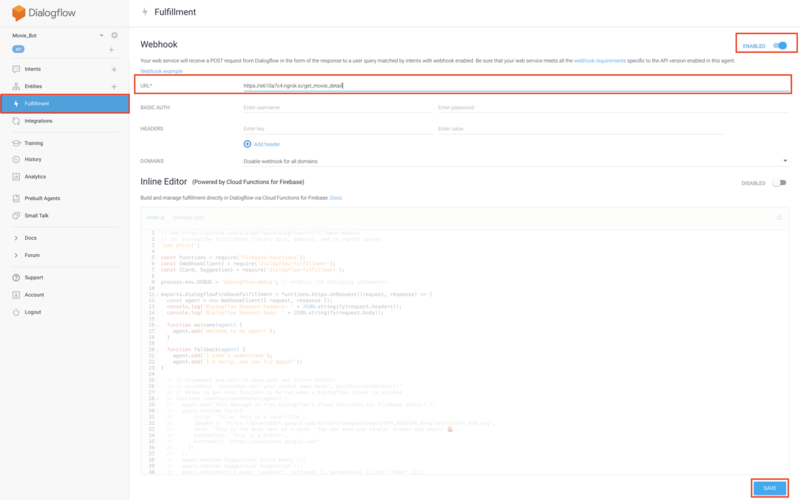 Click on Fulfillment on the sidebar of your Dialogflow console. Next, enable the webhook using the toggle button as indicated on the image below. Then, add the URL you just copied from Ngrok - https://0a36e90a.ngrok.io/get_movie_detail (Replace https://0a36e90a.ngrok.io with yours). Finally, click the SAVE button to save. Pusher Channels does the job of adding realtime functionality to applications. We’ll use this to add realtime functionality to our bot. But before we can start using the platform, we need an API key. Head over to Pusher and create a free account here or sign up (if you don’t have an account already). Once you are logged in, create a new app then note down your Pusher app_id, key, secret and cluster. We’ll need them later. Replace app_id, key, secret and cluster with your own Pusher keys which you have noted down earlier. We'll create a simple interface where users can type a message and send. On the same page, they should also see their message and that of our bot. Here we imported bootstrap, jQuery, Pusher library, style.css and our custom.js file, which we are going to use later on. When a user submits a message, we’ll send it to Diagflow to detect the intent of the user. 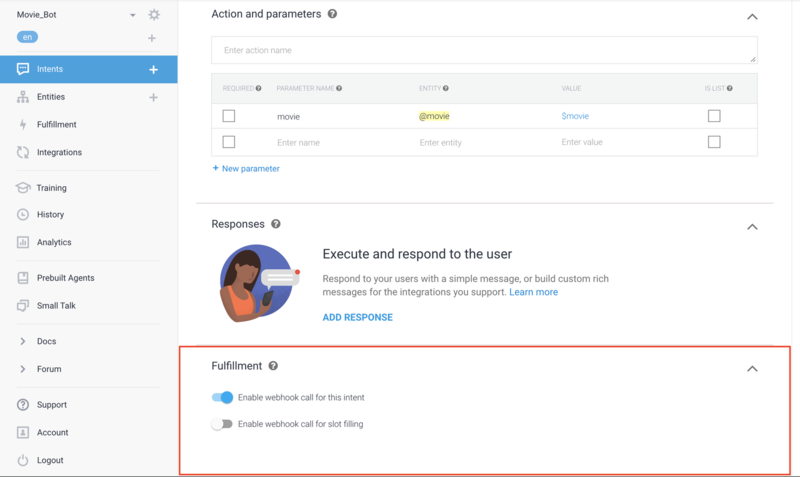 Dialogflow will process the text, then send back a fulfillment response. For the sake of simplicity, we used “unique” as the second parameter in the detect_intent_texts function. This is meant to be a unique id of the user using our bot so that the bot can maintain session among different users. Now, let’s display all messages and responses our chat bot’s page. Here, we created a function - submit_message - that will be invoked once a user submits a message. Then, we’ll use jQuery to send the message to our route - /send_message - from where it will be processed. Finally, we’ll append the response to the HTML DOM. The preceding code will listen for when the user submits the message, then call the submit_message function to submit the input text from the user. Good job! Let’s test what we have now. Terminate the server by typing ctrl + c.
Restart the server using flask run. Now visit http://localhost:5000 and start chatting with the bot. Let’s now make our chatbot more interesting. Any user on the chatbot page should see in realtime conversation currently going on. Next, trigger an event to Pusher when a user sends a message. We are passing the socketId so that the user triggering the event will not get the message back. Now let’s listen for the new_message event on the movie_bot channel. When the event occurs, we’ll attach the message to the HTML DOM. Don’t forget to replace <PUSHER_KEY> and <CLUSTER> with your correct Pusher details. To test the app, restart the server. Ensure ngrok is running. Note: if you have restarted ngrok, you will need to add the new address to Dialogflow. 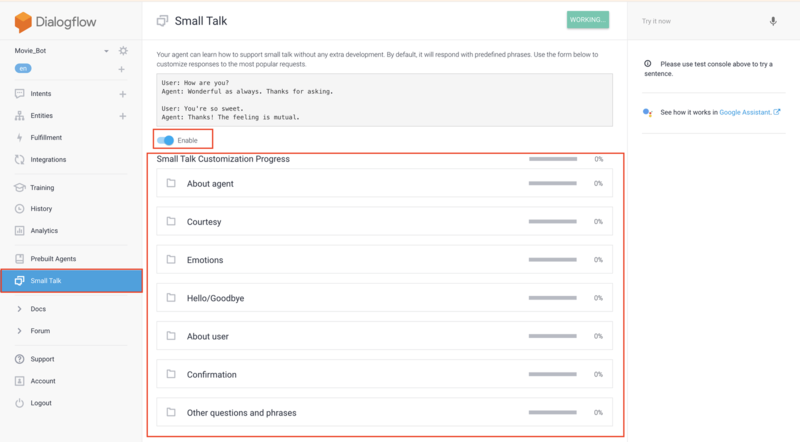 In this tutorial, you have learned how to build a chatbot using Flask and Dialogflow. Also, you learned how to add realtime functionality to the chatbot using Pusher. Now that you are confident in building chatbots, why not build something! What about building a todo bot for your company? Don’t forget to use Pusher to add realtime to the app so that others will see the todos been added, and manipulated in realtime.